As you might expect from a game that hoovers in money at a rate of space-knots, Star Citizen has its own convention. 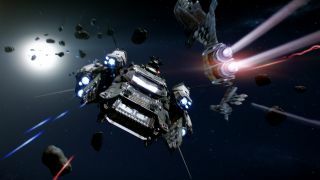 It's called CitizenCon, unsurprisingly, and at this year's vaguely dystopian-sounding CitizenCon, developers Roberts Space Industries showed off some early footage of the game's planetside features. When you tire of shooting, trading, racing, or paying real money for virtual spaceships, you'll be able to land on planets and walk around in first- or third-person, something that does look quite nice, even if the cutscene-based landing procedure disappoints post-No Man's Sky. By "quite nice", I of course mean, "phwoar, look at all the lovely futuristic furniture and metropolitan sci-fi skyboxes". The moment, about six minutes in, when the demonstrator emerges into the city hub proper is particularly impressive, even if the character animation needs a bit more work. From what I can gather, the focus with Star Citizen is more on living in its world than being active in every part of it, hence the promise of being able to walk around your ship and look out the windows as you land on a planet, rather than physically guiding it into a planetside docking bay. As you can see above, the actual landing part is currently handled via a short cutscene, as is the moment when you pierce through a planet's atmosphere—but those bits are obviously subject to change, etc etc.